Manuscript map of the historic Five Points. This is a one of a kind early 19th century manuscript map of the New York City's Collect Pond or Five Points region. Cover's parts of southern Manhattan between Broadway and Cross Street, including Leonard Street, Anthony Street, Elm Street, Pearl Street, Duane Street, Center Street, Canal Street, Walker Street, Franklin Street and White Street. Shows marshes, tanneries, the rope walks, the tar house, water sources, hills and housing. While we are uncertain who originally drew this map, we can make some conjectures regarding its date and origins. 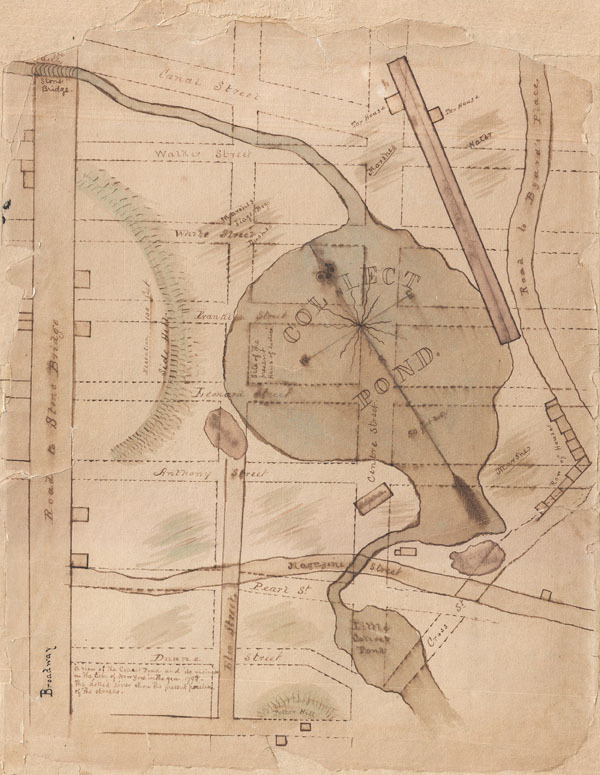 The map ostensibly depicts the Collect Pond area in 1793, about five years before Fitch tested one of the first steamboats on the Pond and about twenty years before the Collect was finally filled in. A note in the lower right corner notes that modern streets have been ghosted in with dotted lines. The street configuration and the presence of the Halls of Justice (also known as the Tombs), lets us date this between 1835 and 1850. This would have been at the heights of the 'Five Points' slum period described by Martin Scorsese's in the 2002 film, Gangs of New York. The Five Points slum, which appeared in the 1830s after the Collect Pond was filled in for health reasons, was one of history's most desperate slums. In the late 19h century, after over 80 years of infamy, the Five Points were leveled and redeveloped much as it is today. We can only speculate on why this map was drawn and who drew it. Stylistically, it bears some resemblance to school girl maps, which were common in the period, though the subject matter would have been unlikely in this context. It also bears some similarity to surveyor's manuscripts in regard to the detail in which it is laid out, but the lack of measurements belies the possibility that it may be one. We have found a few printed maps of the Collect Pond and Five Points which are similar, most notably a map that accompanied a broadside asserting the claims of Fitch over Fulton as the inventor of the steamboat, but none that correspond exactly. If this map were in fact a prototype for later printed maps, we have not been able to identify an exact map which may have been descended from it. Even so, this is a rare and unique piece and a valuable part of the Five Point history. Good condition. This came to us in pieces. We have painstakingly reassembed and restored it. A few pieces are missing still, but all in all, it is new in a very presentable state.